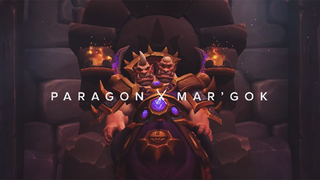 Only 4 guilds were capable of defeating Imperator Mar'gok on the hardest difficulty, the final boss of Warlords of Draenor's newest raid, and the quickest one was the Finnish top guild, Paragon. While that's impressive, their newly released kill video is just as awesome. Watch 18 minutes of epicness below from multiple guild members' view. I guess dramatic music, with numbers flashing and the boss' SFX added, always works. Also, nerd screams around the 17:15 mark. And if you're interested how many times they died before the boss finally went down: 122.